My favorite cookie for frosting and decorating for any holiday or special event including Easter, birthdays, weddings, Christmas and Valentine’s Day. I’m serious when I say ‘The BEST Sugar Cookies’ because I’ve never had any that were so perfect in texture and taste. I have so many of my favorite recipes that were first published on my site before people I know were even using the Internet. No, I am not kidding! I first put the recipe for The Best Sugar Cookies online at my first website and then added them to the blog a decade ago, you know when we didn’t know each other? It’s the perfect time to share again or honestly, for the first time. I simply LOVE these cookies, I get how the word ‘best’ is subjective but these have such a great taste and texture that they truly win that designation in my book. That they are easy makes them better than best even. They go way beyond the Christmas holidays too; I’ve made them for birthdays and St. Paddy’s Day and yes, even prepared dozens of those gold and white sparkly ones for friends who were renewing their wedding vows. It’s amazing what a bit of colored sugar can do to make them personal. For many years I would spend days each holiday season making rolled and decorated sugar cookies. I started the tradition in my twenties with a girlfriend and we made hundreds of cookies that we rolled, cut out, frosted and decorated and gave to friends. I continued on with that tradition for many years when my kids where small and it became a fun family holiday experience for all of us as they got old enough to help. We loved sharing them with our neighbors, friends and family. Easter? Sure! 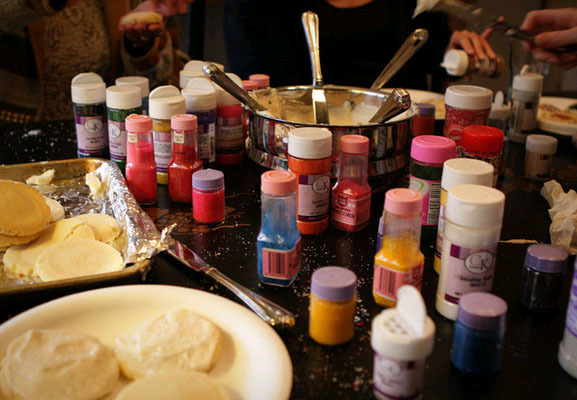 The neighbor kids and I just recently decorated a huge batch with Easter Egg colors for me to hand out to all of the kids on the street…they really are fun and easy; just ask the three 9-year old kids who helped! But one day, there were no little girls wanting to help mommy make Valentine hearts, Easter bunnies, or Santa sugar cookies and I was ready for something simpler. I’ll keep that big box of cookie cutters for the time when my children have their own children and I can make them with grandkids but for me at this time, these are not just the next best thing; I think they are even better! No matter that this is an old recipe; sometimes they are the best. They may be simpler to make than cutout cookies, but have such a great taste and texture; so good, so light, and just the right amount of crisp. The ingredients include powdered sugar and some vegetable oil; I’m sure that’s a big part of it. Seriously…crisp but not hard; you must try them! They are perfectly wonderful with just a dusting of sugar but for something even more special, I will add a layer of frosting before those sprinkles! I made these cookies for neighbors for Valentine’s Day last year and one sent me a text 5 minutes after I left telling me they were the best sugar cookies she had ever had. Wow!!! See, I told ya! Many years ago I volunteered to host Denver’s South Metro Cooking Club Meetup at my home and help members make sugar cookies. We spent an afternoon with an assembly line of cookie making. Knowing I would have up to 15 people in my kitchen making and decorating cookies, I thought this recipe ideal and it was quite the production. Two people making batches of dough, two making frosting, two managing the baking and the rest of us either decorating or maybe just drinking wine and chatting up guests (yes, me…so?). We had such a blast and these very old photos gives you an idea of how many hands were in the mix. Literally. We frosted some and simply sprinkled sugar on others but mostly we just had so much fun and everyone left feeling accomplished and with a plate of their own decorated cookies. I should do that again shouldn’t I? My Hanukkah version might have gotten a bit browned but hey, I’m sticking with just trying to make the cookie color match the gold sparkles! 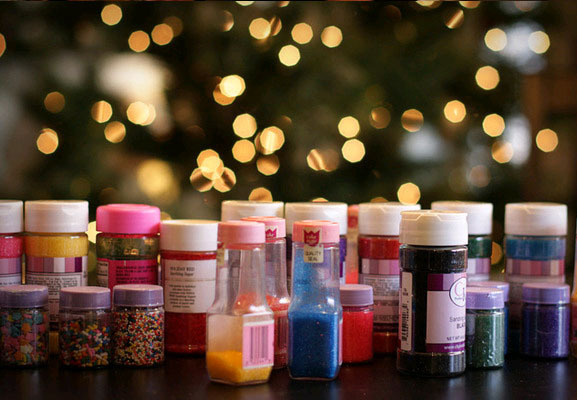 For me the real key to these being successful with just sprinkles meant changing the product I used for decorating. No longer happy with the bottles of decorations meant for cookies with sugar the size of your regular granulated sugar, I’ve graduated to using the larger sugar decorations typically used for cakes. 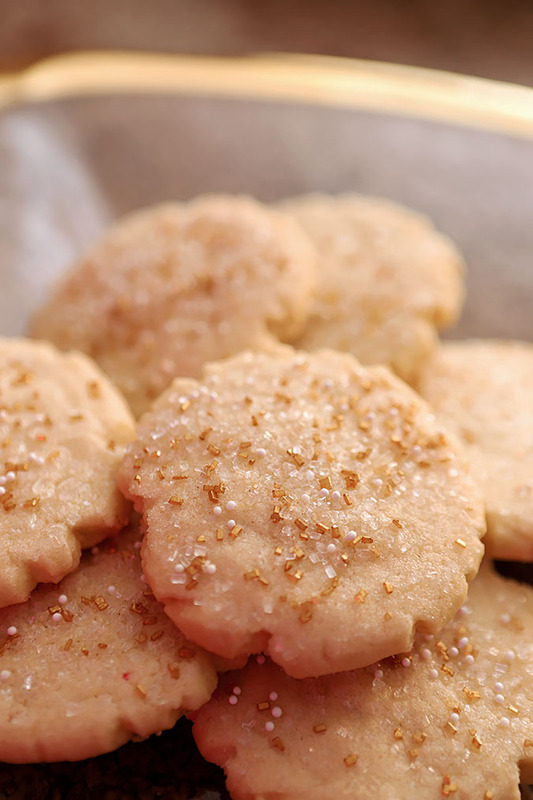 This Wilton White Sparkling Sugar is my go to for both these cookies and for decorating the rims of cocktails too; their size makes for a true crystal look and they’re beautiful. There are lots of colors available too. I also love these Wilton Sugar Pearls; they’re always a nice contrast. Santa is never forgotten either. He must be stuffed after getting goodies at each house but no matter; they are all gone when we get up in the morning! This past Christmas season I had my neighbor kids over to help me out then too. They did not make these cookies; no they made ones that appeared to each have a half bottle of sprinkles them…but they had fun! I really do mix them up a lot and they’ve been my go to for birthdays and holidays for many years now. With or without frosting, they truly are The Best Sugar Cookies! These cookies are great just rolled in sugar (see notes for some suggestions) and are perfect for the holidays with some buttercream frosting and holiday decorations. Cream butter and add sugars and mix well. Blend in oil, eggs and vanilla, in that order. Mix dry ingredients and add to creamed mixture and beat til thoroughly combines. Roll into balls and flatten with a glass dipped in sugar. Remove from cookie sheets after a minute or two and then allow to cool completely. Beat butter for a few minute on medium speed. Add 3 cups of powdered sugar and mix on low speed until the sugar is incorporated. Add vanilla extract, salt, and 2 tablespoons of milk/cream and beat for approximately 3 minutes. For a stiffer consistency add the remaining sugar. For a thinner consistency add the remaining milk 1 tablespoon at a time. This is so good for mother and child bonding. Not only does my son love cookies (especially sugar cookies because of the texture), he also loves making it himself. Would love to try this recipe, perfect for all occasions — just play a little with color, shapes and design! I love making these with kids because they can make them all by themselves. I’ve done cutout sugar cookies with kids and they can decorate them but I always had to do the rolling and cutting part! Have fun…let me see what you end up with too! Sugar cookies are great! Old recipes are indeed the best, and this is maybe the best of the best. Thanks! I do love decorating cookies even though I am hopeless at it. I don’t really like making cookies but I so love cookies at the holidays, especially ones with colored sprinkles. I think platters of freshly baked cookies just make a home in winter, at the holidays so cozy and festive. These cookies do look like the best! Truly one of my favorite cookies. For everyday use I just roll them in sugar, slightly flatten and bake. We love those too! 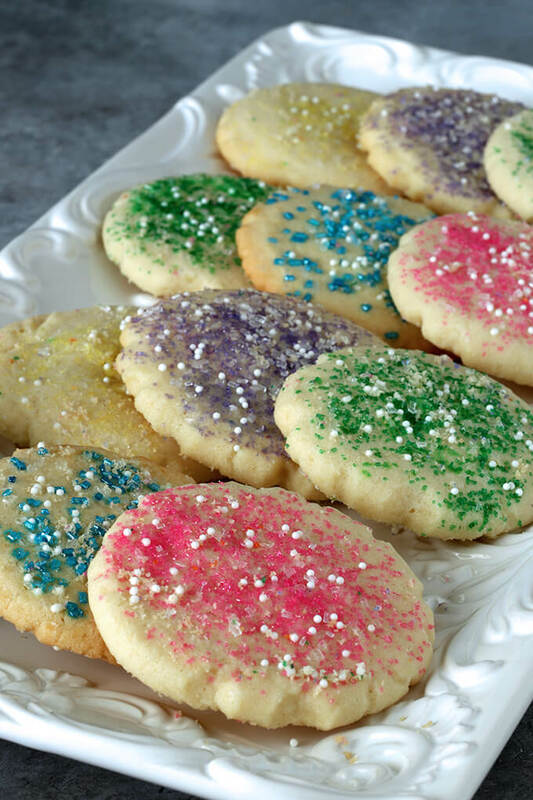 I love sugar cookies…and these look so simple & yummy! Thanks for sharing! Those remind me of cookies my mother used to make. I loved them and one day she announced she lost the recipe. I can’t wait to see if this is “it” ! I got the recipe from a neighbor years ago. She knew very little about cooking and I helped her learn a lot but she had this recipe her mom had given her and it was her pride and joy. And rightly so…please do make them; they are really simple and so good. I love doing both but wonder where I had the time before. Just an fyi: you can buy rolling pin guide rings that are sort of like big rubber bands that go on your rolling pin. They are different thicknesses and the size will determine the thickness of your dough. I’ve given a lot of those as stocking stuffer type gifts but they really are handy. The cookie decorating party sounded like a ton of fun and your daughter must be wishing she was home to celebrate her birthday with you. Best wishes to her 🙂 Great idea to keep some cutters for using with the grand-kids…what fun you will all have together. I’ve made this buttercream frosting before but I’ve never made these sugar cookies before. I will give them a try for sure. I saw a recipe the other day for ‘the best buttercream frosting.’ It was butter, sugar, vanilla and cream. Isn’t this like the basic standard that you think everyone will know? It’s still one of my favorites; I’m happy with it on a graham cracker! What do you put in the butter balls or pecan ball…I can not find the ingredient on this page. I’ve made many versions of this cookie, but don’t believe they have ever included powdered sugar in the dough. 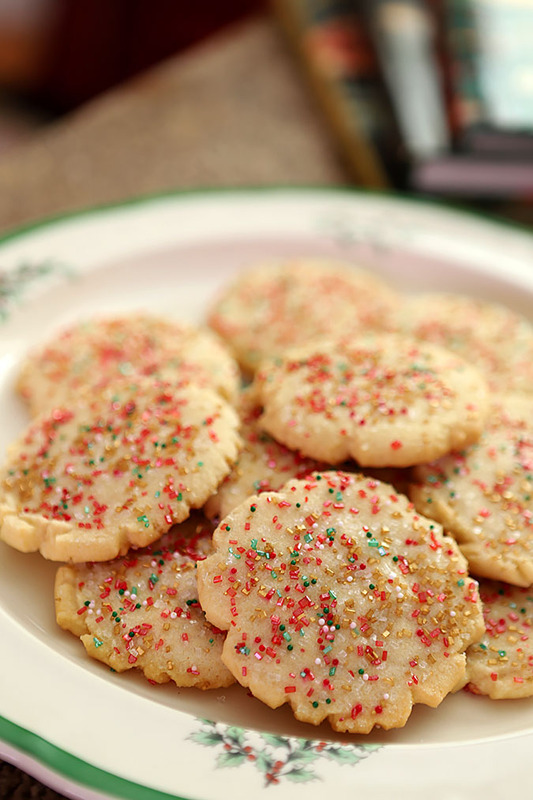 Since I’m always looking for the perfect sugar cookie recipe, I will be trying this one! It just might be the one! Thanks! Love to hear what you think…I love how light and crispy they are; just calls out for a bit of frosting if you ask me! I tried this cookie recipe today and cut it in half. I’m not a huge sugar cookie fan but these seemed simple for the holidays. I think the recipe came out too sweet, and your cookies look thicker than mine came out. Would you suggest making larger balls, or not pressing down too hard when flattening them out? The frosting is delicious. Thanks for sharing! Hmm…never considered them too sweet in particular; sort of ‘just right.’ But as far as the pressure…I don’t press them super flat, just enough to take them from a ball shape to a flatter shape; they still spread when baking. 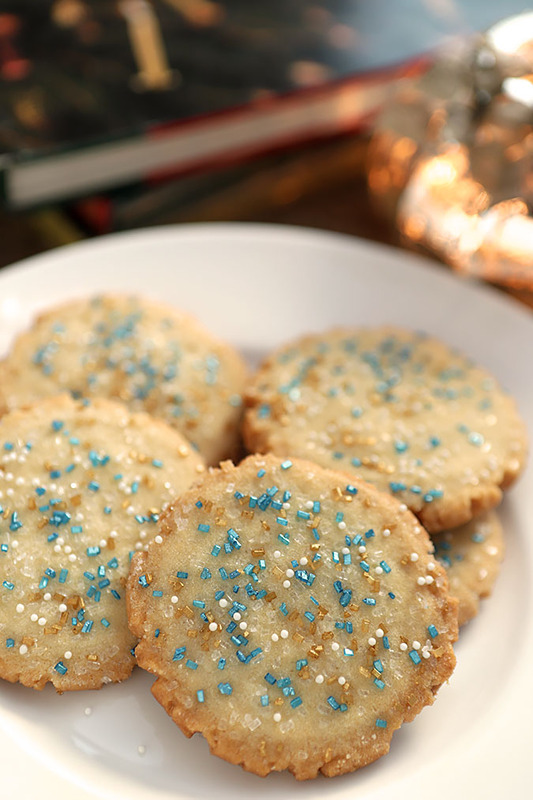 I can’t believe there is canola oil and butter in this sugar cookie recipe! They look wonderful and for a woman who doesn’t do a lot of cookie decorating anymore you sure do have a load of supplies there! Merry Christmas Barb. All the best in 2011. Well, I still decorate but am sort of out of the rolling and cutout stage. I actually bought a bunch of beautiful new decorations from King Arthur Flour and would not have even brought out some of those sprinkles; I mean who uses purple for Christmas? Well, my guests did so glad I threw the ‘old’ stuff into the mix! Though I’ve been tempted to see what would happen if I tried all butter, I’ve never taken that leap because I love how these turn out. I’m sure it adds to the lightness of the cookie and the wonderful crisp (but not hard) texture. I’ve been wanting to make sugar cookies forever and you’re recipe sounds perfect. And look at all those different colored sprinkles. What fun! My baby’s still too small to help make and decorate cookies, but this sounds like a great tradition for future years. Mmm, butter cream on a sugar cookie?! I’m all over that! I know! It’s not a necessity but it sure does make for a yummalicious cookie! The simple cookies are often the best! I am sure you had a lot of fun baking that day. I’m not a big “sweet” fan but do love a good sugar cookie. Sorry I couldn’t make the blogger meet up at your house, I didn’t get the invitation until Saturday. I love a good Rose wine..especailly on the back deck in warm weather! This post brought back so many memories from my childhood. It makes me miss my momma. Since I don’t have kids and the neices and nephews live away – it’s not quite as fun. Glad you were able to use so many photos. It was a fun time and the recipe was a keeper. Sounds like you all had a fabulous time – I ‘m hoping I’ll get one more year out of my guys decorating sugar cookies but I have a feeling that even if they stop, I’ll still need to roll and cut the cookies out!! The buttercream frosting sounds delicious. I don’t frost much but my daughter loves it. I’ll bookmark for our next cookies. Those cookies are so pretty. The ones with just the pretty white sugar crystals! Gorgeous! Lots of cookie recipes over at my place today for Share a Spoon. Please feel free to link up if you like! I’m going to make this recipe this weekend with the rest of my baking for sure! Wow… You really have quite the assortment of cookie decorations there. This recipe looks fabulous! Wine and cookies! Two of my favorite things! 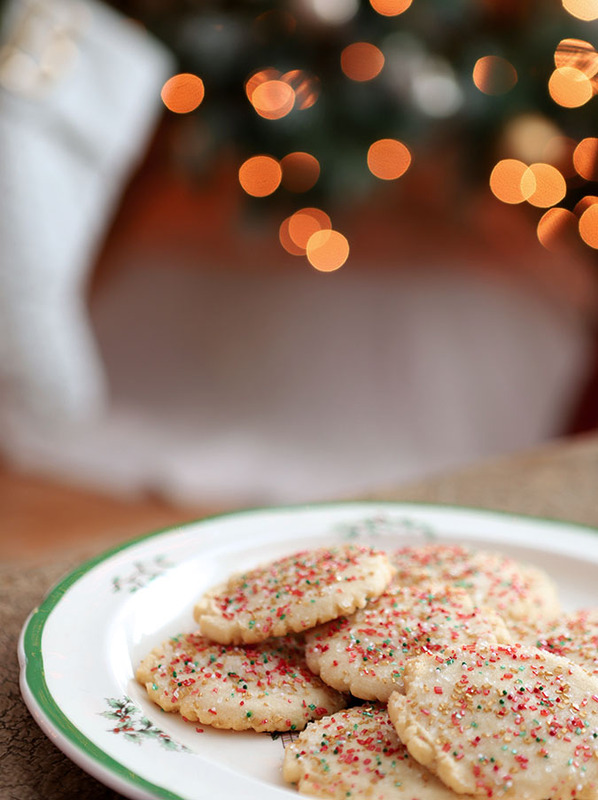 I’ve never tried a drop sugar cookie before – I love how easy this is. Thanks for sharing. Love your post Barb. Great cookies, great pictures! Gorgeous pictures and gorgeous cookies! They look scrumptious! How fun! I have so many wonderful Christmas cookie memories. I can almost taste them. Your photos are beautiful.